This year I’m going to start something new for all the weekend warriors out there who track the weather all week hoping it’s going to blow on the weekend. It’ll be a weekly post on Thursday with my best guess at where and when it’s going to be rideable. It’ll be for the coastline of Lake Michigan from Holland north to Pt Betsie. I’ll try to keep track of how accurate I am by saying how I did last week and keep a tally going of how I do overall. Nailed It will mean that 3 of 3 days played out how I forecasted, Close will be 2 of 3 or 1 of 3 and Way Off will be 0 of 3. I’m no meteorologist, but I’ll just go off the forecasts put out by NOAA, etc. and my experience in the past of how things play out. Should be interesting and hopefully helpful for making plans. Friday: Supposed to rain and snow. There will be a strong NNE wind up by Manistee later in the day, but overall conditions are not good. It’s a no go. Saturday: Looks like mid afternoon the wind is going to come around NW and make riding possible in Muskegon and Grand Haven if your willing to brave the frigid temps. I personally wouldn’t recommend it, but with the sun out, which is expected, some experienced riders could go out. Bring your big kites. Sunday: Wind will be offshore at ENE for most of the coastline with snow and rain moving in later in the day. Get your green out and open the schedule for St. Patrick’s day. Well, lets hope the sun comes out Saturday. 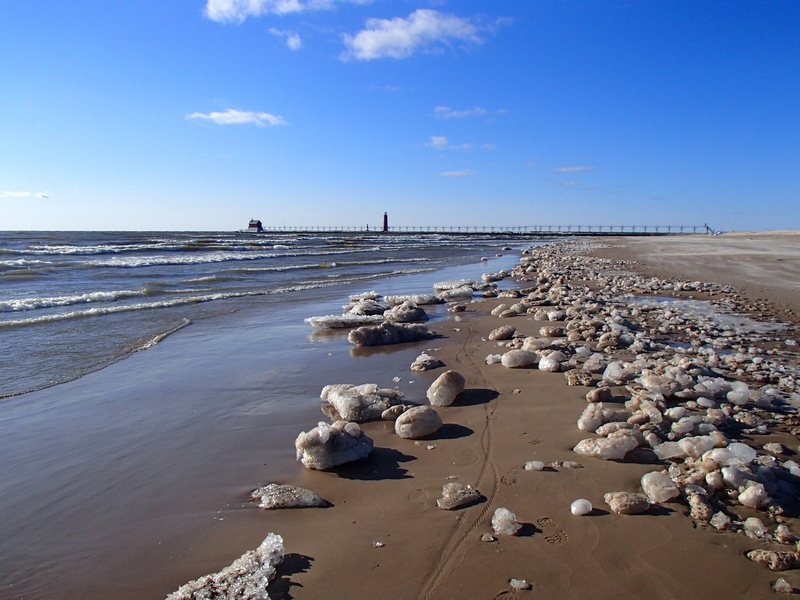 Here’s a picture of the beach at Grand Haven from yesterday. Ice is disappearing allowing for access.